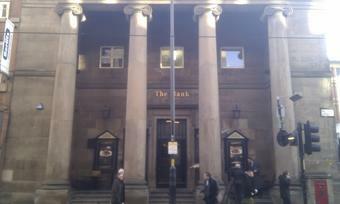 I have passed this place on many previous visits to Manchester & kept walking out of some reverse snobbery I suppose. Too grand for the likes of me! This year I ventured in because it was raining & I was hungry. Glad I did. A pint of Doom Bar @ 3.00 was surprisingly cheap & the food was top notch. Friendly service too. Plenty of space & a wide range of customers: post work drinkers, families, ladies who lunch late & tourists like me. Quite a large spacious pub with plenty of seating and a rotating selection of real ales to choose from. Never seems particularly busy or lively, but perhaps that is disguised by the size of the place, allowing people to spread out more. No complaints here. Sampled a London Porter here last night. Was in fine condition but a bit pricey...£3.10 a pint. It's OK for a couple but I couldn't spend a lot of time here. As previously mentioned in my earlier comment, the venison sausage and mash is still being served. A Nicholson's pub that has been tastefully converted from a former bank obviously, it has some nice quiet corners to sit down and relax in. Service polite and efficient, the ale range was nothing special but my pint of Pale Ale was more than drinkable. A boozer that would be good to start or end a session in. Good ale and a friendly welcome, nice atmosphere too.